Our discounted Roulette Set with 12 Inch Wheel includes everything needed to play the game of roulette. 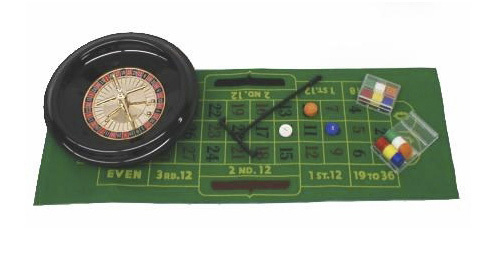 It has a 12 inch plastic roulette wheel, two roulette balls, a small felt roulette layout measuring 12 inches x 31 inches, 120 plastic printed playing chips, and a small roulette rake to make you look like a pro. Great for someone who wants to practice playing roulette on a small budget. This roulette set makes an excellent present. Packaged in a full color gift box.